An Israeli rights group has posted three photographs it says show misconduct by soldiers of the Israel Defense Forces during a three-week offensive in Gaza in 2008 and 2009. Breaking the Silence, an organization of former soldiers that works to expose what it says are the under-reported costs of sending young soldiers to the West Bank and Gaza, published the images on its Facebook page Sunday. The group says the images were likely taken during the course of Operation Cast Lead, a three-week Israeli offensive in the Gaza Strip that ended in January 2009. You can access the Facebook page here along with the photos. 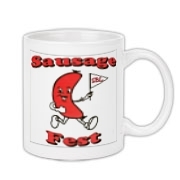 Before You Attend the SBL, Buy the Sausage-Fest T-Shirt! And you can, really, here. Or better yet, get a mug. Or still better yet, get a shirt and wear it to SBL and keep the mug at home to remind you of the awesome time you had there!! It’s a sad and disgusting but tragically true fact that when the rubber hits the road you can generally discover why most people do things when you track the money. For instance, those ‘Anti-Muslim’ crusaders opposing the Murfreesboro, Tn mosque are in it not for love of God or country, but money. It’s typical. Follow the money and you’ll find the real reason 95% of ‘religious’ fundamentalists do what they do. All you have to do is think of the so called ‘Ark of Noah’ hunters and ‘Ark of the Covenant’ loons and the millions they bilk from the gullible and you’ll see the pattern. Emerson and his ilk are thieves. He’s been sampling the stash his officers have seized. I had no idea you could sue people just because they threatened you! Had I known that, I could have made an absolute fortune, last week alone! I’m glad this story surfaced and I sure hope Kelly wins. I’ve already got some people in mind who will enrich my coffers. A southwestern Pennsylvania man called 911 to complain about some terrible marijuana he had just purchased, which turned out to be something other than pot. Police say the man told officers he bought the substance earlier that day and that “it was nasty” when he smoked it. Uniontown Detective Donald Gmitter says a field test determined the substance wasn’t pot at all, but police didn’t say what it was. Even though the 21-year-old man didn’t technically buy marijuana, he isn’t off the hook. Sgt. Wayne Brown tells the Pittsburgh Tribune-Review that Wednesday’s incident remains under investigation, and the man could face a charge of possessing a counterfeit controlled substance. Chris, Chris, Chris… does your depravity know no bounds? I wish I were. Just so I could attend Roland’s paper. Alas, however, I’ll be at ASOR the week before. Staying away for two weeks isn’t something I’m willing to do. Not to mention the expense of attending two fairly pricey conferences back to back. Of course he is. Which is why the Republicans will never cut aid to Israel. Israel could nuke the United States and Republicans would say it was perfectly acceptable. In short, for Republicans, it’s Israel first, Israel last, Israel only. Even when America’s own interests are at stake. Thanks Republicans. Now please remove those ‘America First’ stickers you like so much and those American flags you love to flaunt and go ahead and replace them with Israeli flags. Your true loyalties are showing. Why is the United States Supporting The Duplicitous Thug Karzai? Afghan President Hamid Karzai said Monday that once or twice a year, Iran gives his office $700,000 to $975,000 for official presidential expenses and that Washington also provides “bags of money” because his office lacks funds. Karzai’s comments come a day after The New York Times reported that Iran was giving bags of cash to the president’s chief of staff, Umar Daudzai, to buy his loyalty and promote Iranian interests in Afghanistan. Our feckless Government pours more money down the toilet than imaginable. And this particular toilet is Afghanistan. And its President Karzai is nothing but a taking any money from any source that offers it hoodlum. Hey Washington, thanks again. I feel all warm and fuzzy knowing that tax dollars are propping this puppet king. And this puppet is glad for it. Jennifer ‘Hiccup Girl’ Mee has been charged with murder. A Tampa Bay woman whose uncontrollable hiccups brought her worldwide attention is charged in the killing of a 22-year-old man during a robbery. Jennifer Mee, 19, of St. Petersburg and two others are charged with first-degree murder in the death of Shannon Griffin on Saturday. Sgt. T. A. Skinner of the St. Petersburg Police Department says Mee lured Griffin to a home where the others robbed him at gunpoint. Police say Griffin was shot several times. Skinner says Mee and the others admitted their involvement. NPR President Vivian Schiller apologized on Sunday for the network’s handling of the Juan Williams controversy. In a statement which was released Sunday, and was first seen by Politico, Schiller stood by the decision to fire Williams for his comments about Muslims on Fox News. But she apologized for NPR’s hasty response to the controversy surrounding his remarks: “I regret that we did not take the time to prepare our program partners and provide you with the tools to cope with the fallout from this episode…the process that followed the decision was unfortunate – including not meeting with Juan Williams in person – and I take full responsibility for that.” Schiller also wrote, however, that the ultimate decision was the right one. If it was the right decision, why apologize? They may have gone about it the ‘wrong’ way (is there really a right way to fire people?) but if the decision itself was sound, there’s nothing to apologize for. There’s such spinelessness these days and so few really willing to make tough decisions and then say ‘that’s what I’ve done and I’m not apologizing for doing what’s right’. Stand up and stand by your decisions or please just do nothing. All this whimpering is annoying. The article deals with two sites – Jahaz and Ataroth– both mentioned in the Mesha Inscription as having been built by the “king of Israel”. These sites feature characteristics of Omride architecture west of the Jordan, at places such as Samaria and Jezreel. The most obvious among these features are an elevated podium surrounded by a casemate wall and a moat. The article deals with the reasons for employing Omride architectural styles in Moab. It also suggests that building operations that seem to have been conducted by King Mesha were influenced by Omride architectural elements at the two Moabite sites. ZDPV 126 (2010). As always, Finkelstein’s worth reading. Thousands of New Zealanders took to the country’s streets on Monday to protest against possible plans to move production of Peter Jackson’s “Hobbit” movies overseas. With some dressed as hobbits or other characters from Middle Earth, they carried banners saying “New Zealand is Middle Earth” and “We Love Hobbits,” aiming to reassure nervous Hollywood studio executives rattled by a short-lived union boycott. Pictured to the right, Tim Bulkeley, on his way to a ‘Free the Hobbits and Free Old Testament Scholarship’ rally.